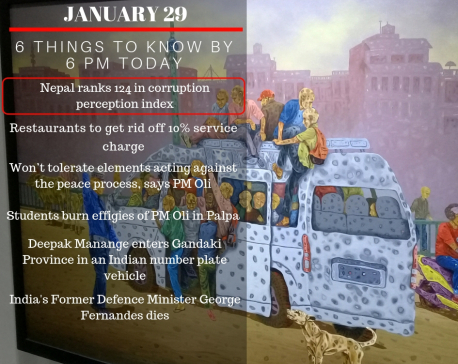 That corruption is rampant in Nepal has been attested by Transparency International’s annual corruption perception index report. What is really troubling for the people at the grassroots is the fact that the leaders they chose to govern and carry out various administrative and development works have themselves been thoroughly corrupt. According to a survey report of the Commission for Investigation of Abuse of Authority (CIAA) made public in January this year, Nepal’s municipalities and rural municipalities are among the most corrupt agencies and they make people pay extra charges to get their works done. The report says that municipalities and rural municipalities are only second most corrupt entities after land revenue offices. As many as 41.6 percent of respondents of the survey complained they had to pay extra money in offices of municipalities and rural municipalities against the services provided by these entities. Recent Republica report from Itahari adds credence to CIAA’s survey. According to Itahari-based regional office of CIAA, in the fiscal year 2018/19, as many as 364 corruption complaints have been filed against local units of 14 districts in the eastern region and majority of them are against local units of Saptari, Sunsari, Morang and Jhapa. Corruption is more rampant in education sector, land revenue offices and district forest office among others. According to CIAA, many local units do not follow Procurement Act. This not only paints really a bleak functioning of local governments but also has raised the question of if devolution of powers to the local authorities has come to mean decentralization of corruption from the center. This is the tendency that must be nipped in the bud, for if the government allows it to flourish, it will breed deep public resentment against the powerful local units the country has created under federal set up. Corruption at the local level is a serious threat for many more reasons. First, the framers of the constitution granted sweeping powers to the local levels with the belief that local actors can better understand development needs of the people and they alone will be able to address those needs. This is why, it was argued, locally elected actors need to be made all powerful. But nearly two years after the local governments started working, people are still not satisfied with their works and one of the main reasons against their dissatisfaction has been involvement of those leaders in corruption. Anecdotal evidence and several first hand reports have brought out how ward chiefs, chairpersons of rural municipalities and mayors of municipalities are misusing millions of rupees in purchase of dozers and in awarding contracts to people they like (in many cases the local leaders themselves double as contractors). Most of these incidents are not reported because mayors and ward chiefs tend to game the system in collusion. Poor governance at local level will not only dent credibility of the system but also frustrate people. While political leadership must chart the way to hold local leaders to account, CIAA’s proactive steps in prosecuting corrupt actors will set a strong precedent to deter others from misusing taxpayers’ money for personal gains. Local units serve as the bedrock of our federal system. Measures must be taken before this very foundation of our governance system goes thoroughly corrupt. Decentralization of power from Singha Durbar to villages must not prove to be decentralization of corruption.